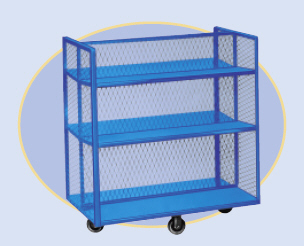 OP Order Picking Truck - Roll-A-Way Conveyors Inc.
2-sided truck has expanded metal, is all steel with welded construction, and has 6 separate compartments. Ideal for virtually any industry. 5 “ x 2” Payflex cushion tread wheels with roller bearings standard. Additional wheel types available. Bumpers optional. Powder Coated Blue. Overall height 48”.